One common theme in all of these densely populated Colombian cities is heavy traffic and noxious fumes. The traffic in Cartagena in particular seemed to always be at a standstill within the small historical center of the walled city. The roads are narrow, and sidewalks are insufficient in width for the amount of foot traffic they receive. Within the Centro Histórico, bicycling is absolutely the best mode of transport. I cannot imagine having to navigate a car there (and having to sit in it for countless hours while breathing in those fumes over the course of a week). Driving in Colombia has been quite an experience. All of the times I’ve ridden in the car with my dad didn’t even come close to preparing me for the style of driving that people are accustomed to here. It makes me wonder where these people learned to drive and leaves me astounded that we haven’t witnessed any serious crashes so far. From the taxi and bus drivers to the police, the motorcycles and our own personal host in Cartagena, nobody hesitates to cross into oncoming traffic lanes in order to pass other drivers, even when oncoming traffic is imminent. Our host, Miguel, even crossed into the oncoming lane to pass cops and buses. I’ve learned that as long as there is a bit of space in front of the vehicle, the driver will continue to accelerate, probably to avoid another car coming to cut them off. If there isn’t much traffic on a road, it doesn’t matter how twisty and narrow or hilly it is – the drive will be fast. However, in the city, there is never not much traffic. It always smells like diesel and gasoline exhaust, and the fumes are sometimes intolerable. The only vehicle where the seat belts were actually in working order was the tuktuk we took up a long, steep, unpaved road from San Jeronimo up to the Finca where we stayed in the mountains for a few days. Whenever I’m in a moving vehicle on the road in Colombia, I have to relax and tell myself that these people know what they’re doing. Besides, I have little to no control over the situation, so if I want to get somewhere I have to trust the drivers with my life. In Cartagena, I had the great fortune to try my hand at driving myself. 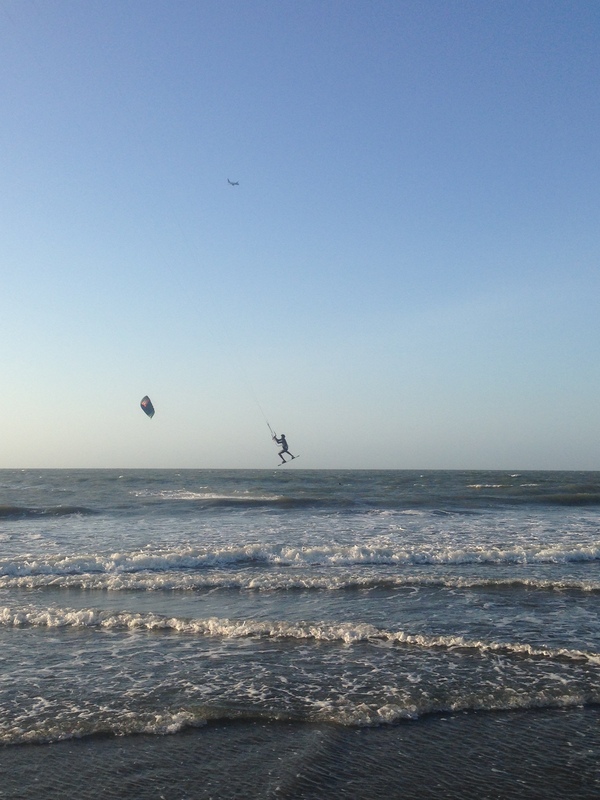 Miguel was driving us back from the beach after a tiring few hours of kitesurfing. Traffic was moving more slowly than usual, and Miguel suddenly asks me if I know how to drive. I’m sitting in the back seat with Hannah, a German who is also staying at his AirBnB rental, and Dallas is in the passenger seat. Miguel suspects there is a police checkpoint up ahead, which is slowing everything down. He hadn’t had so much to drink that he couldn’t drive, but he didn’t want to risk getting checked by the cops. I was the only one who hadn’t had any beer, so Miguel pulled over so we could all switch positions. Miguel has a small Kia Picanto that I had never seen before. 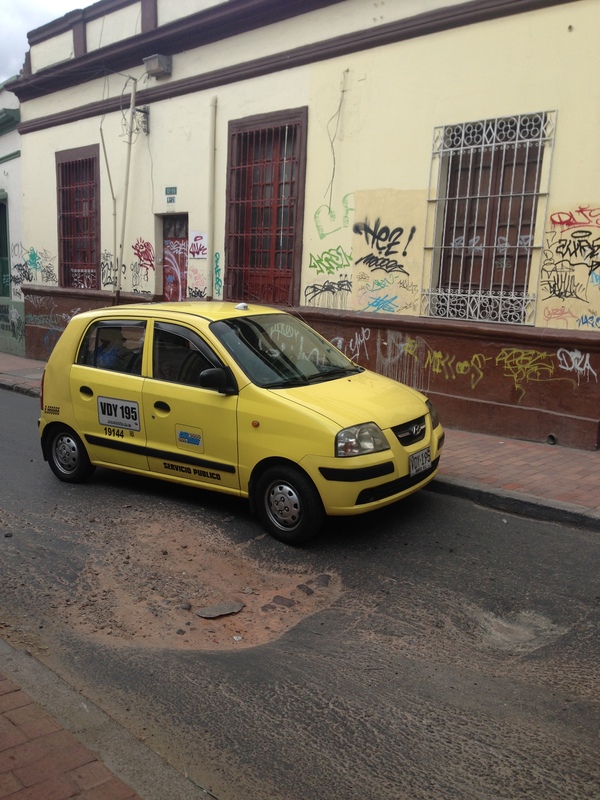 It’s very cute and perfect for driving in a congested city (not counting the motos and bicycles). I hadn’t driven a manual transmission in a few years, but the car was easy to drive and handled well. Even though there were police up ahead, people didn’t change their driving styles, and cars were sneaking in front of me if I left them enough space. It wasn’t nearly as scary as I thought it would be, but I was happy to hand over the wheel to Miguel again once he deemed us clear of the checkpoint zone. 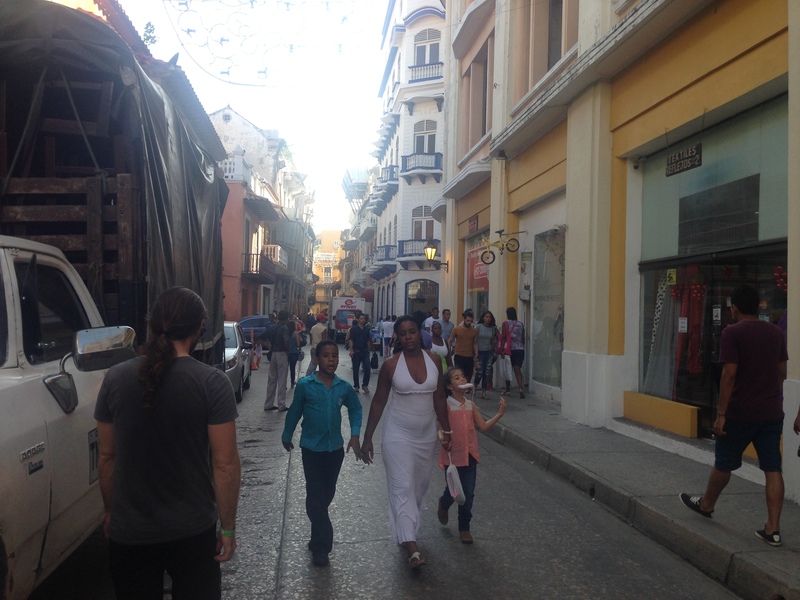 The streets in Cartagena’s centro historico are always full of people. 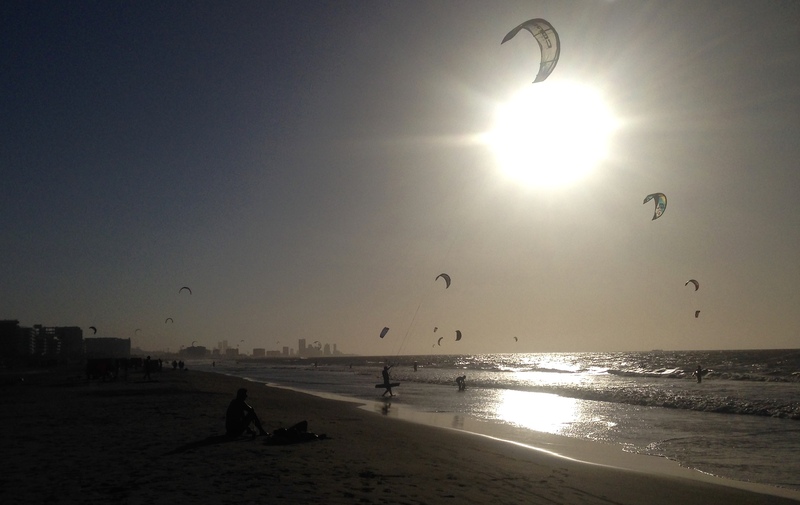 Cartagena is the exact opposite of Bogota in terms of climate. At sea level and on the Caribbean, the temperature never dipped below 80F. During the day it is too hot to want to go outside at all, so most people do what they need to do in the morning or after the sun is lower in the sky. The people of Cartagena have darker skin and seem to get much of their heritage from Africa as opposed to Spain. They identify more with the rest of the Caribbean than they do with Colombia. The touristy part of the city is quite small and has a very old and charming air about it. Streets are narrow and the architecture is lovely, with luscious vegetation overflowing from balconies above and thick vines twisting upwards from street level. It reminded us of the French Quarter in New Orleans. A small example of the plants that seem to be thriving out of every window and crawling around all the buildings. After walking around with our heavy bags during the hottest part of the day for a few hours, we concluded that Cartagena is much more expensive and more difficult to find a hostel than Bogotá. We eventually settled on bunk beds in a rather dirty hostel for 35,000 pesos each (about $11 per night). The next night we found a nicer hostel with a private room just outside of el centro histórico in an area called Getsemani. The city has a really interesting history, and we should have learned from our time in Bogota and taken a bike tour or walking tour the first day, but just walking around we got a sense of the historical significance of the place. Streets have names like “La Guerra” (the war) and “Calle Del la Bomba” (street of the bomb). And then there is the Castillo, which was the only fort built by any of the Spanish colonies that was under siege but never seized. We didn’t get to visit it before leaving, so we will have to go back some day. The hostel where we stayed for our second night organizes a shuttle bus to Playa Blanca, a popular beach on Isla Barū. Advertised as one of the most beautiful and serene beaches where you can get away from all the people, I was skeptical when I saw how many tour buses and boats have trips out there daily. We arrived around 10am on a Wednesday and were immediately bombarded by locals trying to sell us…everything. The most annoying were the men selling oysters, or some type of shellfish. They would walk around with a bucket full of them, carrying one in their hand that they would shove in front of us (mostly in front of Dallas), so we would have to turn not to walk into it. I wondered how many other armpits those shellfish had visited. Our plan was to rent hammocks to spend the night on the island, but we ended up renting a cabaña instead for 50,000 pesos. That was half the money we brought with us, so we had to be very careful to budget for the rest of our time there. After all the daytime tourists get back on their boats or buses, the beach really did get more relaxed and peaceful. 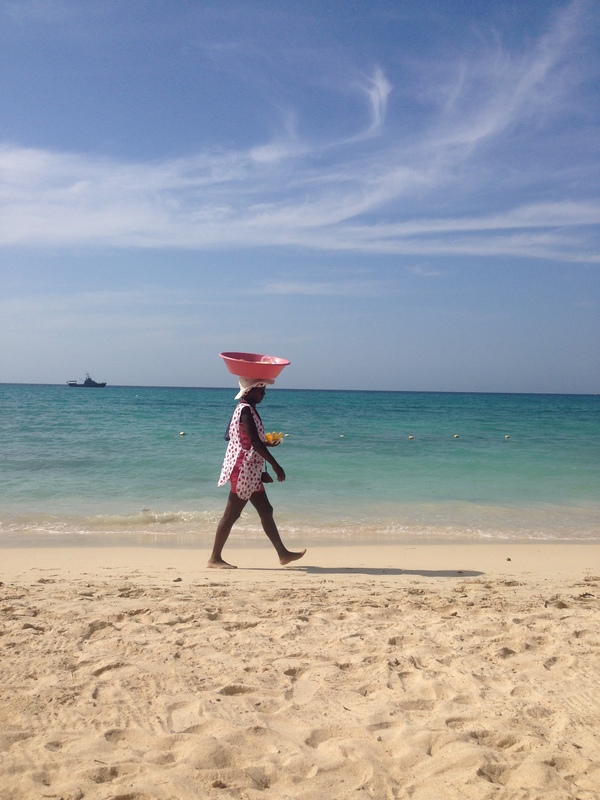 We weren’t constantly turning down people hawking their various food and drinks, and we could walk the beach until sunset. This is the first meal we had before finding our hostel in Cartagena. 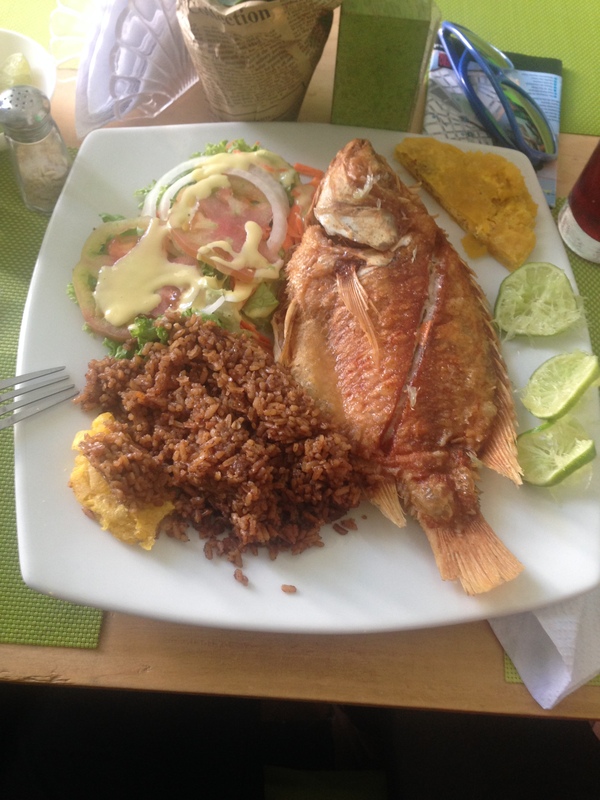 Being a Caribbean city, fish is the most popular dish here. Dallas and I always share a plate, which is more than enough to keep us full. The fish is usually reddish and comes fried whole on a plate with rice, patacone (smashed and fried plantain patty) and sometimes salad. The proper way to eat it is with your fingers, and everything but the bones are edible (sometimes even the bones can be consumed). We had this fish for lunch and dinner on Playa Blanca and had just enough cash left over for some fruit and water for breakfast the next day. When we arrived back at the hostel, it was time to go to meet our AirBnB host. 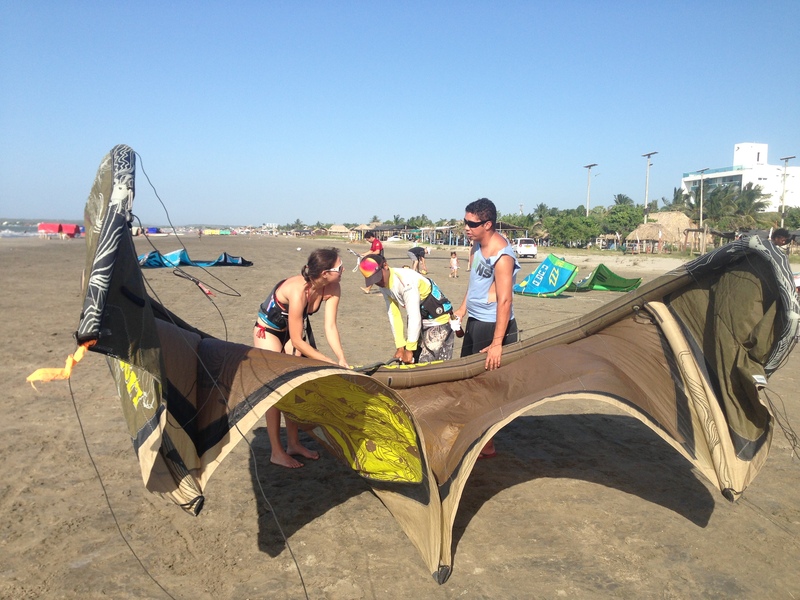 We chose Miguel because he had good reviews and he promised to show visitors the way locals live in Cartagena. It was Christmas Eve, and we thought it would be nice to spend a few nights with some local people as opposed to being surrounded by other orphaned tourists. Miguel delivered on his promise, and we had a wonderful experience with him and his other guests in his neighborhood of Los Almendros, about a 20 minute cab ride from the centro historico. He was home to greet us and offered us cold water and small bottles of beer called Costeñitas. It’s so hot on the coast that some people prefer to drink beer in small bottles so they have time to finish it before it gets warm. Then they just get a fresh one from the fridge more frequently. Once settled in, Miguel introduced us to his neighbor who was stirring something in a huge pot over an open fire in the park across the street. 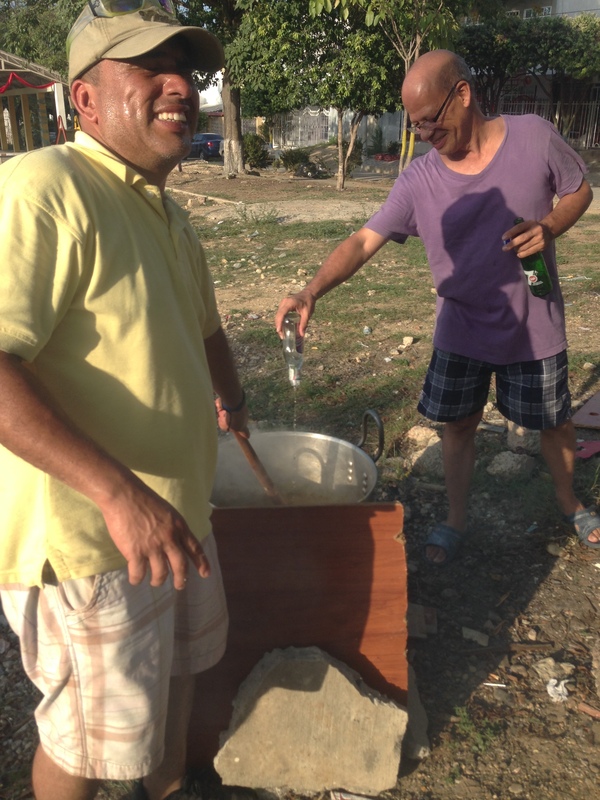 Other neighbors were helping – one brought over some grated coconut and milk while another man poured an entire (small) bottle of Aguardiente (distilled sugar cane drink that tastes like licorice) into the pot. Antonio, the man who was in charge of making the Natilla, which is some kind of corn-based pudding or custard, gave us a taste of it from the big spoon. It tasted like corn porridge, but he still had to add the coconut, cinnamon, and more panela (sugar). We also got to talk to his other neighbors who appeared to spend their time hanging out at the tienda on the corner, running up a tab. We were each treated to three or four Costeñitas by the time we retreated to Miguel’s house to plan dinner. 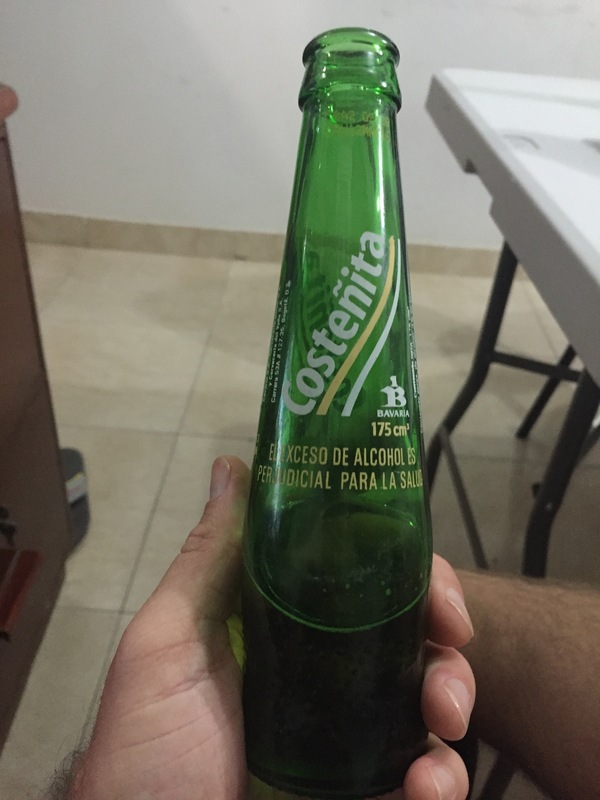 The Costeñitas come in 175cc bottles and cost less than 50 cents each at the tienda on the corner. Miguel drove us to the supermarket along with Michelle and Tyler, two other American guests who had arrived just after us from Panama on their way to Ecuador. We each prepared a dish to share with everyone else for our Christmas Eve dinner. Miguel made pork, mashed potatoes and plantains, Michelle and Tyler made pasta with mushrooms and broccoli and garlic bread, and Dallas and I made apple & mountain berry pie. Two other AirBnB guests, a Russian/Canadian girl and a German girl who now lives in Portugal, also joined us for dinner. 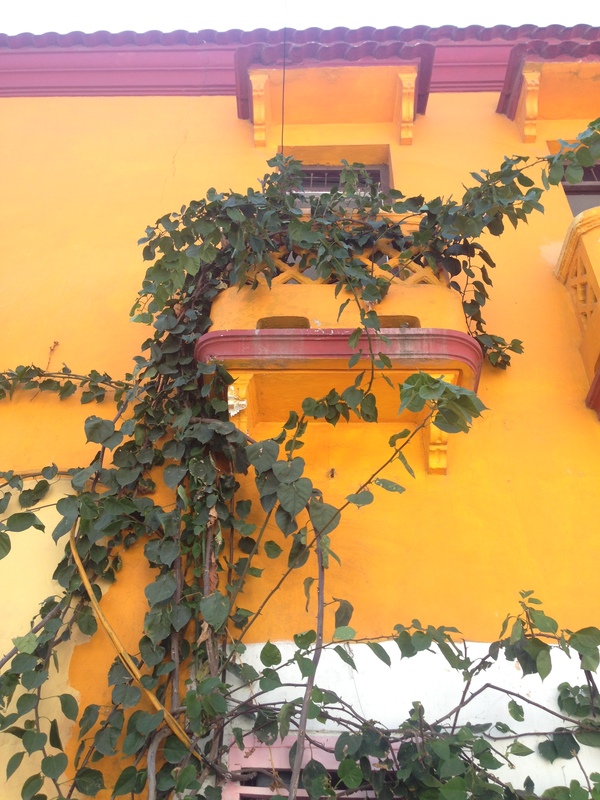 Dallas and I cherished our local experience in Cartagena so much, we extended our stay with Miguel from two nights to four. We highly recommend staying with him or someone like him if you visit Cartagena. Any place can be enjoyed more fully when you get away from the other tourists and make real connections with the locals.